The impish shoot’em up is undeniably entertaining, even though Wheatley fails to establish a visual geography to better follow the dispute. 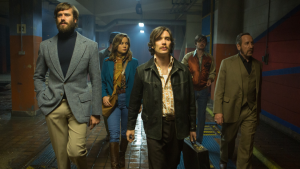 A number of recognizable actors (Cillian Murphy and Armie Hammer as the pros, Sharlto Copley and Sam Riley as the hotheads, Brie Larson as the liaison) are game to some down-and-dirty action, but Free Fire is just a minor detour for a filmmaker who can be more than another Tarantino clone. Three planets. A layered mystery with a dollop of black comedy, Elle is very wrong in the best way possible. A contained Verhoeven is as good as his most debauched self, with the invaluable assistance of Huppert in a bravura performance. Four and a half planets. Snowden does a much better job than Oscar-winning documentary Citizenfour filling in the audience on the programmer’s trajectory and his motivations. Once again though, Snowden’s partner Lindsay Mills gets the short shift, in spite of a spirited performance by Shailene Woodley. It’s never clear why Mills has stuck through thick and thin with the whistleblower. Love only gets you so far. Three and a half planets.